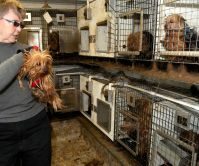 Home » Posts » From the President » Puppy Mill Dogs in Jeopardy AGAIN! Puppy Mill Dogs in Jeopardy AGAIN! Another threat to dogs in puppy mills has emerged. Regardless of how bad a breeding facility is or how many violations a breeder has accumulated, the United States Department of Agriculture (USDA) automatically renews licenses for commercial dog breeders on an annual basis. While the USDA is proposing to refuse license renewal of substandard breeders, they’ve also proposed to require breeders to renew their licenses every 3 – 5 years instead of once a year. This could mean that breeders with terrible violations – for sick, malnourished or injured animals – are able to stay in business year after year. The USDA is asking for your input on this matter. Please ask the USDA to stop renewing licenses of substandard dog breeders and to continue requiring dog breeders to renew their license every year. Go to this Comment link. Click the blue “Comment Now” button. I support USDA’s proposal to no longer automatically renew the licenses of known animal abusers. Please continue to require dog breeders to re-license every year but only upon the condition that the licensees have no serious or critical or repeat violations documented on their inspection reports. Automatically renewing a breeder’s license means that breeders with terrible violations – for sick, malnourished or injured animals – are able to stay in business year after year in spite of chronic and serious violations of the Animal Welfare Act. Require license applicants to disclose any animal cruelty convictions or other violations of federal, state, or local laws; or regulations pertaining to animals including all non-compliant items noted on state inspection reports. Then, please tell your family and friends to take action. The more people who contact the USDA, the better our chances are of keeping in place the life-saving regulations for animals in large-scale breeding facilities.